Add a Fountain of tantalizing chocolate to your next event & make a lasting impression on your guests. "We want to thank you for the amazing Ultimate Chocolate Experience! The chocolate fountain was that elegant, tasty, special part of the wedding that topped things off. We went with the chocolate fountain rather then a cake and we are so happy that we did. Our guests couldn't stay away and neither could we. Your service was exceptional and it was a true pleasure being able to work with you. You made our special day very memorable and we will certainly recommend your "experience"!" Want to make your special occasion more elegant and memorable? A Chocolate Fountain is a magnificent way to make a lasting impression on your guests! Perfect for weddings, corporate events, fundraisers, bar and bat mitzvahs & anniversaries, our Chocolate Fountain’s will be the “hit” at any and all of your special occasions. Belgian Chocolate is used in our fountains as we feel you deserve the best! Our decadent chocolate is available in milk, dark and white. Imagine rich, warm chocolate cascading over these tiered beauties. Yours guests will choose from an assortment of fresh fruit, candies, cakes, pretzels….the possibilities are endless! Our reputation is built on our friendly, accommodating and reliable service that is second-to none! We believe in going the extra mile to make your experience with Sweet Sensations a great one! We personalize your experience to suit you and take pride in playing a special role in your event! We are a local company offering personalized service to suit all of your event needs. We offer chocolate fountain services to all of Southwestern Ontario including London, Sarnia, Windsor, Hamilton, Kitchener-Waterloo, Guelph, Brantford and anywhere in between! Our products are #1, the best equipment, the best chocolate and the best "dippers"! We feel our clients deserve the best! We have never had an unsatisfied client! Our on-site attendants are extremely personal & professional. Our dipping items are guaranteed fresh, and there is no better chocolate than the couverture chocolate we use! Our business is built on our valued reputation. Friendliness, reliability, and personal service is guaranteed. 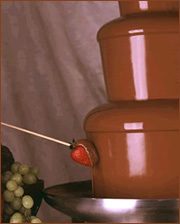 Elegant Chocolate fondue fountains for rent in London and Southwestern Ontario. Perfect for Weddings, corporate events, grand openings, trade shows, private parties or any special event.